Hands-up, a Greek company specializing in the interpretation of sign language, has launched a new service that offers deaf and hearing-impaired people the chance to take guided tours of archaeological sites. Giorgos Stathis, managing director of Hands-up, announced in an interview with the Athens-Macedonian News Agency that the first free thematic tour of the ancient Athens Agora was successfully organized for hearing-impaired people. More than 50 hearing-impaired citizens participated in the first-ever guided tours conducted in sign language, in two organized groups. Mr Stathis reported keen interest by foreigners in this new service, adding that Greece is now providing higher quality services. For more information visit their Hands-up! website. [DEL-fee] (Greek: ΔΕΛΦΟΙ) A city to the west of Athens, with the famous Oracle of Delphi. People went to consult the Oracle for advice from the gods. 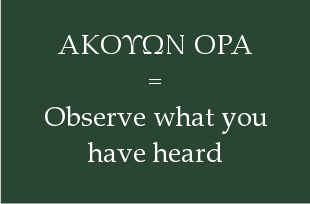 The agora (Aγορά in Greek) was a central public space in ancient Greek city-states.